Be the first to share your favorite memory, photo or story of Dr. Graeme. This memorial page is dedicated for family, friends and future generations to celebrate the life of their loved one. 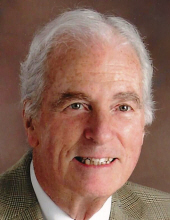 HAMMOND, DR. GRAEME L., 86, of North Haven, CT, died peacefully on Saturday, March 23, 2019, in Acton, MA. Born and raised in Scarsdale, New York, Graeme was a graduate of Denison University in Granville, Ohio and McGill University Medical School in Montreal, Quebec, Canada, where he met his beloved Janet (deceased, nee LeDain). He introduced himself to her in the school registrar office by asking her to memorize his GI service number, to which she replied “absolutely not,” and thus a romance blossomed into an over 55 year marriage. Graeme struggled mightily in school and was told he would never amount to anything – he had better learn to dig ditches because that was all he was good for. He attempted and failed at college, and was subsequently drafted into the Army where his legendary sense of direction sent him to fight with the 10th Mountain Division in Austria during the Korean War. He persevered, discovered he suffered from dyslexia, and went back to college where he majored in geology. During his first field expedition he realized he hated geology so he went to med school on the GI bill, going on to become one of the foremost cardiothoracic surgeons in the world. As a surgeon and educator, he developed new procedures, tools, and surgical appliances, saving thousands of lives. His true medical passion, however, was peptide enzyme research – for which he had federal funding for a remarkable 39 years, with his last grant being approved the day after his retirement party so back to work he went. Graeme started his medical career at the Royal Victoria Hospital in Montreal, completed his residency at the Massachusetts General Hospital in Boston, and perfected his surgery skills at the South Hampton Chest Hospital in London, before spending 40 years practicing and teaching at Yale University. He was a visiting professor at prestigious universities and hospitals around the world, a respected keynote speaker at world conferences, and a well published author of over 120 scholarly papers, journals, and articles. One of his more impressive feats, according to his children, was when he was called upon to be a consultant for Dolly the cloned sheep, who had rejected her own cloned organ. Together, he and Janet lived a life of great joy. They traveled the world, enjoyed the Metropolitan Opera, threw lavish and memorable parties, loved the Adirondacks, delighted in the theater and movies, and raised two beautiful children. Graeme loved sailing, skiing, salt, the news, reading, crab cakes, Caesar salad, motorcycles, crème brulee, and scotch. Although dementia robbed him of his own memories, he was a surgeon, a mentor, a father, and a persona not to be forgotten. He is survived by his beloved daughter Wendy Hammond-Wildes (Bob) of Acton, MA, beloved son Chris (Jennifer) of Powell, OH, three treasured grandchildren, his sisters Mandy Ticknor and her family, and Melissa Lang and her family. Friends are invited to visit with Dr. Hammond's family from 4-6 p.m. Monday, May 27 at Beecher & Bennett Funeral Home, 2300 Whitney Ave., Hamden. A Memorial Service celebrating his life will be held at 10 a.m. Tuesday, May 28 at the Spring Glen United Church of Christ, 1825 Whitney Ave., Hamden. In lieu of flowers, donations may be made in Graeme’s name to Sally E. Shaywitz, MD, The Yale Center for Dyslexia & Creativity, 129 York Street, Suite 1P, New Haven, CT 06511 -- http://dyslexia.yale.edu . To send flowers or a remembrance gift to the family of Dr. Graeme L. Hammond, please visit our Tribute Store. Guaranteed delivery before Dr. Graeme's visitation begins. Guaranteed delivery before Dr. Graeme's service begins. "Email Address" would like to share the life celebration of Dr. Graeme L. Hammond. Click on the "link" to go to share a favorite memory or leave a condolence message for the family.